A stranded adult white-sided dolphin was successfully pushed into the Boston Harbor Sunday after spending the night in shallow water off Winthrop’s Coughlin Park near another dolphin that apparently died overnight, according to the New England Aquarium. Aquarium officials herded the dolphin for several hours Sunday out of the shallow water, into a deeper channel east of Logan Airport, and into the harbor, according to Tony LaCasse, a spokesman for the aquarium. 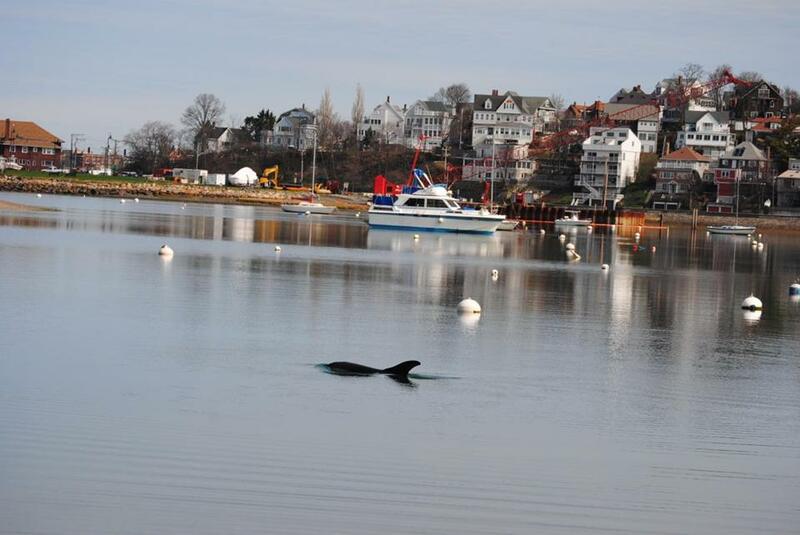 With a sea kayak, a row boat, and a motorboat from the Winthrop harbormaster, officials formed a line to move the dolphin a number of miles. Nearby residents reported seeing the dolphin before midnight with a female dolphin as the tide fell. “Apparently, one of the dolphins was able to get back into the water. By daylight, one of the dolphins had died,” LaCasse said in a statement. On Sunday, officials also used engine noise and slapped water and boats to keep the disoriented dolphin from returning to shallow water. LaCasse said herding dolphins is more common on the outer Cape, where hungry dolphins chase spawning fish in tidal creeks and salt marshes. Although less common, LaCasse said dolphins frequent South Boston beaches and the harbor east of the airport. Common dolphins were spotted two weeks ago in the tidal waters of the Neponset River, below a bridge between Dorchester and Quincy, he said.